Every organization has a different methodology for talent management. 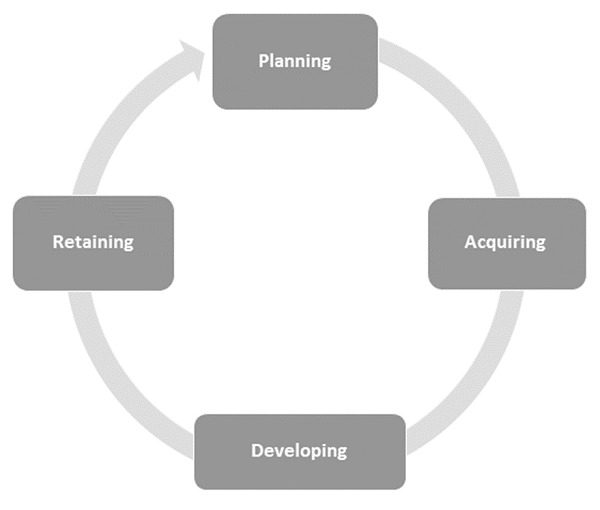 The following diagram shows the complete cycle of talent management which involves Planning, Acquiring, Developing, and Retaining of able and skilled personnel for the organization. Planning − It involves identifying, defining, and setting criteria for required capabilities as well as examining the current talent levels. Acquiring − It utilizes a varied range of strategies to attract talent. Developing − It involves providing opportunities for career development and training, managing employee performance, coaching and mentoring. Retaining − It involves providing long-term incentive, a flexible and positive work environment, and opportunities for advancement of good remuneration. Let us now discuss each of the steps in detail. 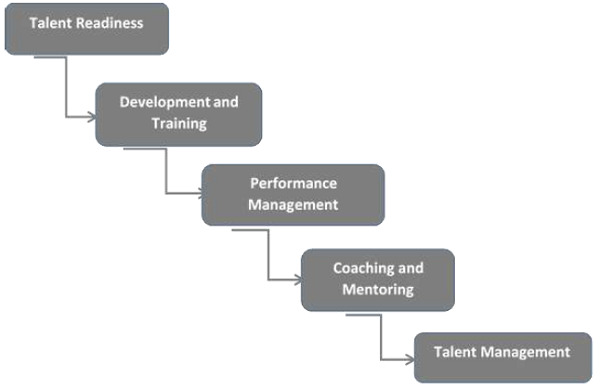 In this methodology, the organization establishes defined competencies and sets criteria to measure the talent skills. Focus on Talent − Once you know what your organization needs, you can start thinking about what type of talent potential to focus on. Define Competence − Competencies are lasting individual attributes that cause high levels of performance. In this stage, the organization clearly defines the specific and usable skills and talents its employees need, so as to realize organizational goals and objectives. Measure Criteria − There should be a set of criteria to evaluate, measure, and develop specific competency. 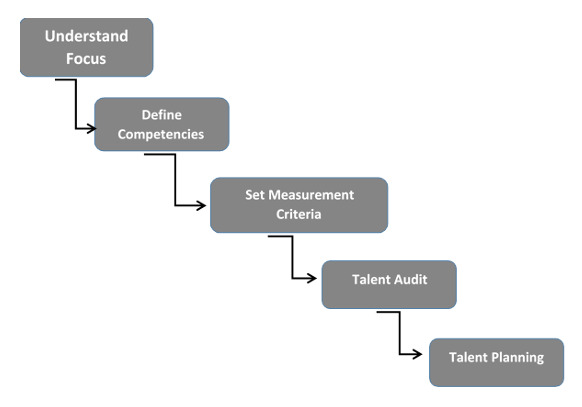 You need objective criteria to measure competencies effectively. Talent Audit − An audit may include different types of activities designed to evaluate the level of competence. Methods include psychometric tests and questionnaires, in-depth interviews, case studies, and analysis of the most recent performance reviews. In this stage of methodology, the organization promotes its values to attract talented people to apply and join the organization. It includes interviewing, selecting, and onboarding employees. Attracting − Organizations promote their culture and values to attract talented and skilled people from the industries to work with. Recruiting − A recruiting brand reflects the core values of the organization and communicates the advantages of working for the organization. Selecting − This process involves multiple steps such as interviews, tests, and background checks. Employing − It is the final stage of hiring the skilled and talented people in the organization. It includes talent management readiness, career development and training, performance management, and coaching and mentoring. These are the core objectives of this phase. Talent Readiness Training − These competencies help the organization attract, identify and develop talent. Career Development & Training − Training program is useful for upgrading talent and skills of the employees and prepare them for future challenges. Performance Management − Performance management incorporates setting goals, giving performance reviews, and providing feedback. Coaching & Mentoring − Coaching and mentoring develops talent by encouraging people to excel at their work and to learn on the job. These techniques engage people on a more emotional level. The longer you retain talented people in your organization, the greater the return on your investment. 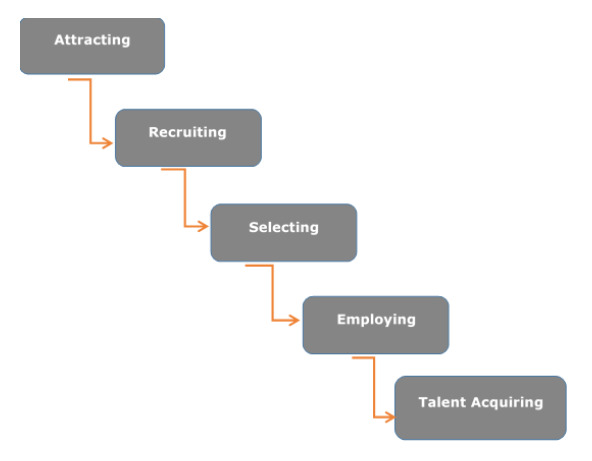 Retaining, the fourth phase of methodology, is to define several strategies that can help retain talent. Long-term Incentives − Long-term incentives such as stock options or paid vacation or other benefits increasing over time can encourage employees to couple their careers and personal goals with a long-term commitment or association with the organization. Career Planning − This involves providing genuine opportunity for advancement to the employees to retain talent in the organization. Flexible Working Arrangements − When working arrangements are inflexible and fixed, the options available to employees are limited – forcing them to choose between staying with or leaving an organization. 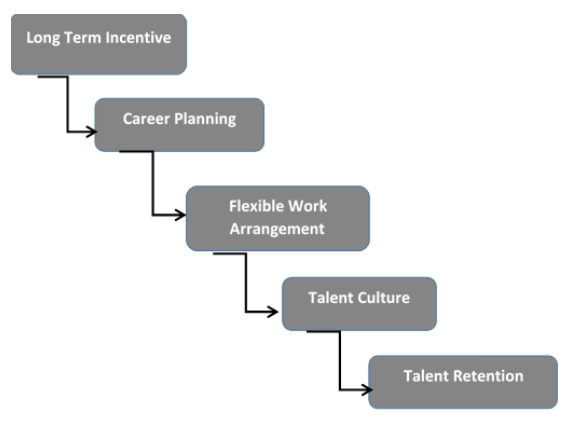 Talent Culture − Positive work environment is a key factor to retain talent. Management needs to monitor these levels of satisfaction so they can forestall problems before people leave an organization.